Work has started on putting a concrete path round the front of the plot so that visitors can gain access from the entrance to the outdoor seating area for the pavilion. 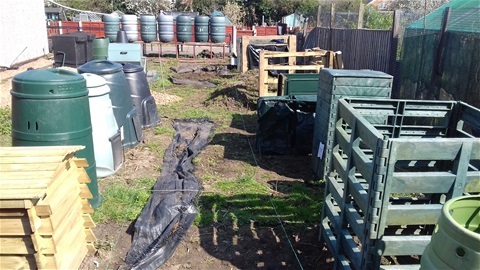 Once this work is completed most of the plot will be covered in woodchip to provide an environmentally friendly surface, clean surface that can be kept weed free. This surface will also be provided for the tumbler bins and the area round the raised beds. The pallet and plastic bins will be on cultivated area of annual flowers to add colour to the site while providing easy access to the bins.